Home » Low Vision » What are the Symptoms and Signs of Macular Degeneration? What are the Symptoms and Signs of Macular Degeneration? Macular degeneration is one of the most common eye diseases in America, diagnosed primarily in patients over 60 years old. As this ocular disease progresses, it damages the macula and destroys central vision. People therefore experience a darkening or blurring in the middle of what they are looking at. This makes it difficult to read text, tell time from a clock, watch TV, and recognize faces. The first warning you may notice is a change in your vision quality. This change may progress gradually into a significant loss of central vision. What signs of macular degeneration should I watch out for? During the early phases of macular degeneration, there are generally no symptoms. That’s why you need regular eye exams by Dr. David Yesnick in Las Vegas. He will check your eyes comprehensively to detect or rule out the appearance of macular degeneration when it first begins. Some forms of this eye disease can advance very quickly, yet they also respond to treatment if caught early enough. I have symptoms of macular degeneration and need an eye exam near me! Where do I go? If you detect any vision changes, contact Dr. Yesnick to book your eye exam as soon as possible. Remember, vision problems could be signs of a vast range of eye conditions, in addition to macular degeneration. Only a qualified eye doctor can diagnose or rule out macular degeneration and other eye disease. 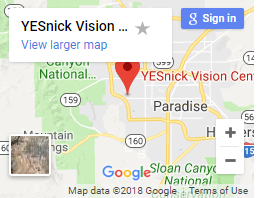 Dr. Yesnick – your compassionate and experienced Las Vegas eye care specialist – will check your eyes thoroughly with the latest optometric technology.  Look no further for an eye doctor to diagnose macular degeneration near me, we are located conveniently to serve you in our cutting-edge and comfortable Las Vegas office. How can I adapt to life with macular degeneration? There is no way to cure macular degeneration. If it is diagnosed early though, there are some actions to take that can help slow the progression of this eye disease. Taking vitamin supplements, quitting smoking, and eating nutritiously may all help. At Yesnick Vision Center, we offer many low vision aids and devices for coping with life with macular degeneration. We will assist you to find ways to adapt to your changing eyesight. 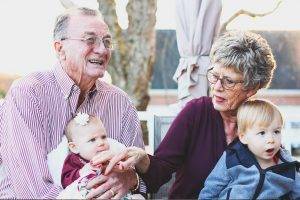 Our range of low vision aids include specialized magnifiers, telescopic lenses, prisms, bioptics, centrasight implants, and various devices to improve your quality of life. We will recommend the most suitable low vision assistance for your individual visual needs and lifestyle. Along with low vision glasses, we also offer a range of computer software for the visually impaired. With different fonts and resolutions and customized programs, our team will help enhance your ability to use a computer and stay connected and social online. 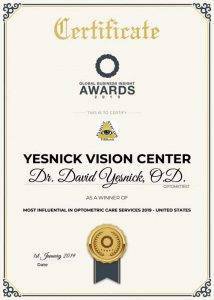 Dr. Yesnick can help you read, drive, see the faces of your friends and family, walk safely – and enjoy seeing all the things you love to do!